Tavolino Della Notte will host a first-class dining experience for you & your guests that will make them look forward to your next meeting. We have 2 private dining rooms & offer all-inclusive packages to help you stay within your budget & have a care-free event. Our Signature Pharmaceutical package is $125 and includes a four-course meal, soft drinks, coffee, tea, 2 glasses of wine per guest, espresso & cappuccino beverages, tax & gratuity. We have a fully private dining room that holds up to 26-guests for a sit down dinner meeting or presentation. Inside of that room is a 55-inch flat screen TV which you can use to connect your laptop for presentations, and is complementary. We also have a smaller room called "Nonna's Kitchen" which holds up to 10 guests and also has presentation capabilities (images below). 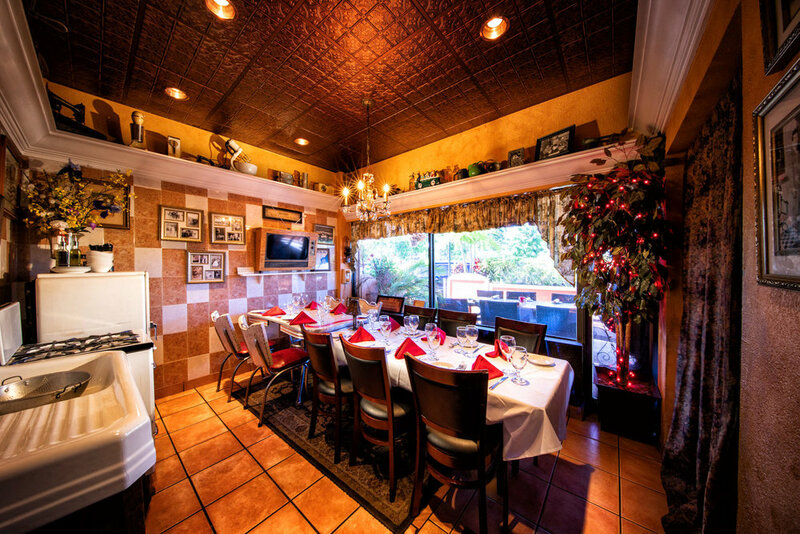 To book your next meeting with us at Tavolino Della Notte, please fill out the form below. If you have any questions or would like to book over the phone, please call & ask for Christina at 954-509-0046. BACKROOM - HOLDS UP TO 26 GUESTS. HAS A 55 INCL FLAT SCREEN TV TO BE CONNECTED TO LAPTOP USING AN HDMI CORD. $1,000 F&B MIN TUESDAY-THURSDAY. NO ROOM RENTAL FEES OR AV FEES. NONNA'S KITCHEN - HOLDS UP TO 10 GUESTS. HAS TV SCREEN AVAILABLE TO BE CONNECTED FOR PRESENTATION. PERFECT FOR MORE INTIMATE MEETINGS, $400 F&B MIN, NO ROOM RENTAL FEE OR AV FEES. Room Seating Style: ONE LONG TABLE FOR 26 PEOPLE, 2 SQUARE TABLES OF 10 AT EACH, TOTALING IN 20 PEOPLE, OR 3 LONG TABLES FOR 26-28 PEOPLE. Full Cancellation Policy and cost: NON-REFUNDABLE $200 DEPOSIT. MAY TRANSFER IF 2 WEEKS OR MORE BEFORE EVENT DATE. MAIN DINING ROOM - CAN BE USED FOR NON-PRIVATE PARTIES OF ALL SIZES, OR CAN BE RENTED FOR A FULLY PRIVATE PARTY OF UP TO 80.